Run time: 1hr 18 mins. PG 13. Starring George Clooney, Matt Damon, Cate Blanchett, Bill Murray, Hugh Bonneville and John Goodman. Based on the true story of the greatest treasure hunt in history, this is an action drama focusing on an unlikely World War II platoon, tasked by FDR with going into Germany to rescue artistic masterpieces from Nazi thieves and returning them to their rightful owners. With the art trapped behind enemy lines, and with the German army under orders to destroy everything as the Reich fell, how could these men - seven museum directors, curators, and art historians, all more familiar with Michelangelo than the M-1 - possibly hope to succeed? 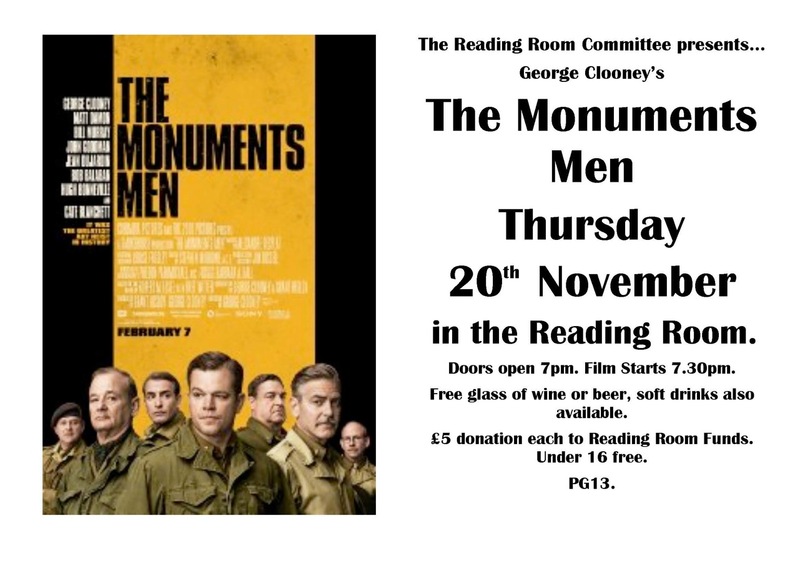 The ‘Monuments Men’, as they were called, find themselves in a race against time to avoid the destruction of 1000 years of culture. (Some images of war violence).